Take this medication by mouth usually every 8 or 12 hours, or as directed by your doctor. You may take this medicine with food if stomach upset occurs. What conditions does Cefaclor treat? Tell your doctor right away if any of these highly unlikely but very serious side effects occur: stomach/abdominal pain, persistent nausea/vomiting, yellowing eyes or skin, dark urine, new signs of infection (e.g., persistent sore throat or fever), easy bruising/bleeding, signs of kidney problems (such as change in the amount of urine), mental/mood changes (such confusion). List Cefaclor side effects by likelihood and severity. What should I know regarding pregnancy, nursing and administering Cefaclor to children or the elderly? Before using this medication, tell your doctor or pharmacist of all prescription and nonprescription/herbal products you may use, especially of: warfarin. Does Cefaclor interact with other medications? 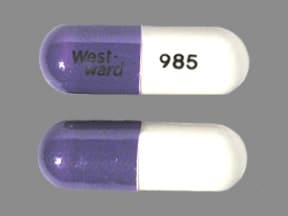 This medicine is a white purple, oblong, capsule imprinted with "West- Ward" and "985". 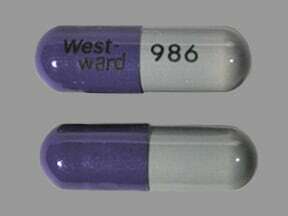 This medicine is a purple gray, oblong, capsule imprinted with "West- Ward" and "986". 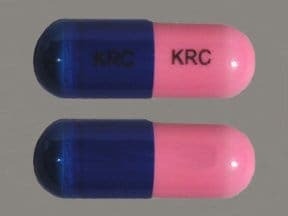 This medicine is a pink blue, oblong, capsule imprinted with "KRC" and "KRC". 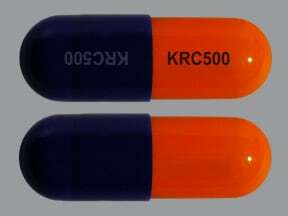 This medicine is a orange blue, oblong, capsule imprinted with "KRC500" and "KRC500". Are you considering switching to Cefaclor? How long have you been taking Cefaclor?